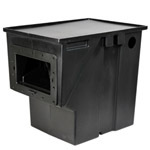 The Laguna Skimmer is a heavy-duty surface skimmer and filter that provides essential filtration to ponds. The Laguna Skimmer has a lift out skimmer net for fast and easy maintenance. The large media/pump chamber allows for custom configurations while the weir door design regulates water intake to the pump chamber. Proper installation of this unit will provide several benefits, including clear and healthy pond water, low maintenance,and a pleasant water garden environment for you and your family. With its rugged construction the Laguna Skimmer is made for lasting and durable performance. 24" x 17.5" x 22"